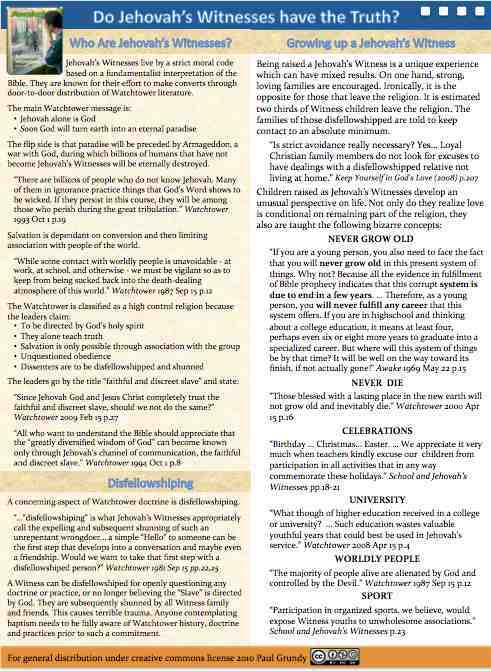 Watchtower quotes that only Jehovah's Witnesses will be saved, and why this is unreasonable. A look at the unique life being raised as one of Jehovah's Witnesses. 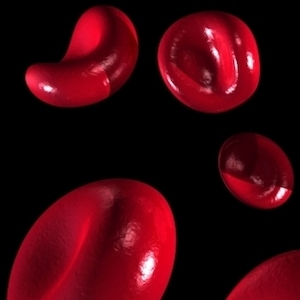 Jehovah's witnesses are not allowed blood transfusions, even at the risk of death. Learn why this is unscriptural. Famous active and former Jehovah's Witnesses, including pictures, videos, interviews and quotes. In-depth analysis of the falling growth of Jehovah's Witnesses. 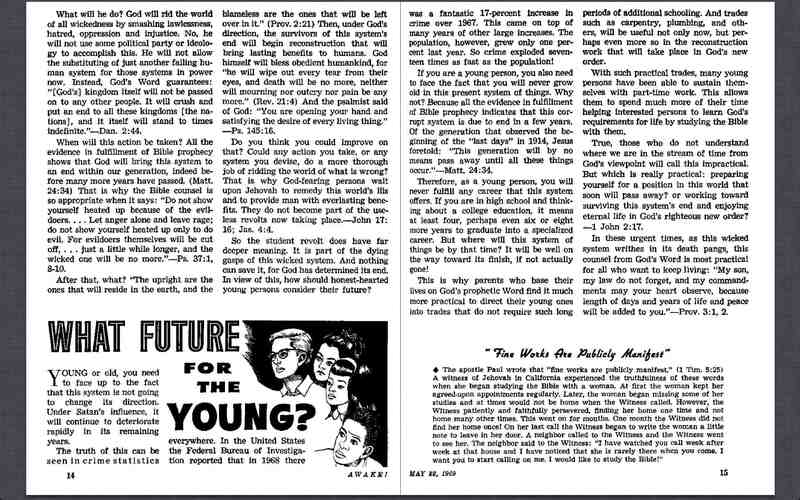 Since its 1879 inception, Watchtower has preached “the End” will be soon, originally predicting it would occur in 1914, then 1925, and “within our twentieth century.” This claim was subsequently adjusted to say the Great Tribulation will be very shortly, culminating in billions of humans being killed at God's war of Armageddon. With a history of significant errors and changes, can God be directing the Watchtower Society? It is rare to see one of Jehovah’s Witnesses sporting a beard, yet the standard regarding beards has been rarely discussed in any Watchtower. 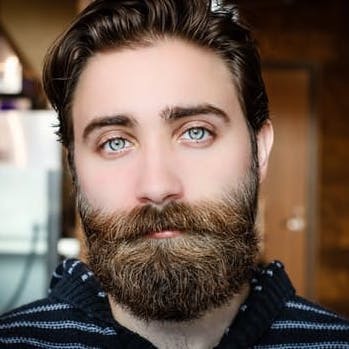 This article discusses the history of bearded brothers, quotes Watchtower advice on the matter, and shows how it is enforced by social identification pressure. 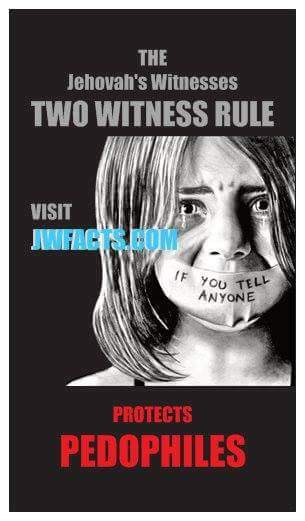 If you are studying with one of Jehovah's Witnesses, click the image for a pamphlet explaining fundamental Watchtower concepts and practices you should be aware of, but will not be told up front. 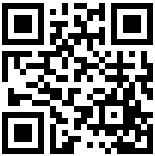 Available in English, Spanish, French, Italian, Portuguese, German, Dutch, Estonian and Chinese. 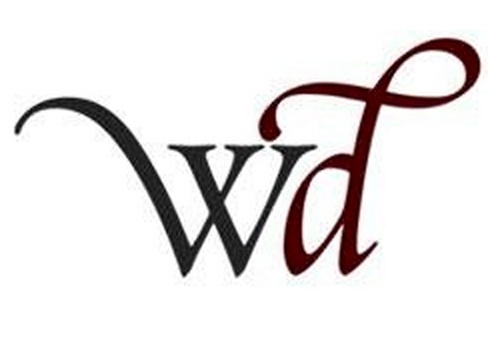 Jehovah's Witnesses disfellowship those that are deemed unrepentant wrongdoers, for practices such as disagreeing with Watchtower doctrine, smoking or fornication. A disfellowshipped person is to be shunned by family and friends, usually for the remainder of their life, so go through tremendous emotional suffering. Although there is Scriptural precedence to avoid people practicing wrongdoing, the Watchtower application of disfellowshipping seriously deviates from Bible guidelines in multiple ways. Watchtower has promoted six different explanations for “this generation” of Matthew 24:34. Many Witnesses based their life choices on the generation doctrine that Armageddon would arrive before all those born prior to 1914 had died. 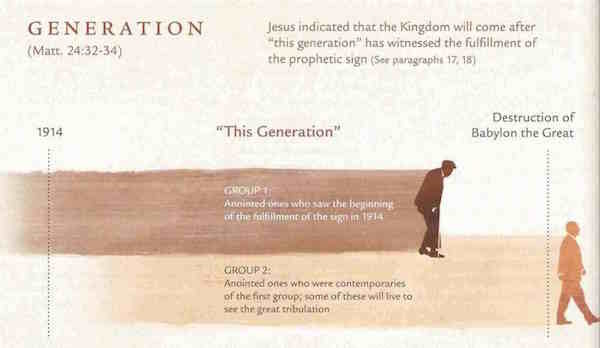 The irrational 2010 change to an “overlapping” generation can be seen as a desperate attempt to ignite urgency in Jehovah's Witnesses. Can an organization that makes ongoing critical doctrinal errors rightfully claim to be directed by God? Follow the remarkable history of this doctrine through over 100 years of Watchtower quotes, and see how the Governing Body continued to adjust the teaching in order to make Jehovah's Witnesses think the end would take place within a few years. Jehovah's Witnesses are to refuse blood transfusions on the belief that the Bible forbids use of blood under any circumstance. Awake! 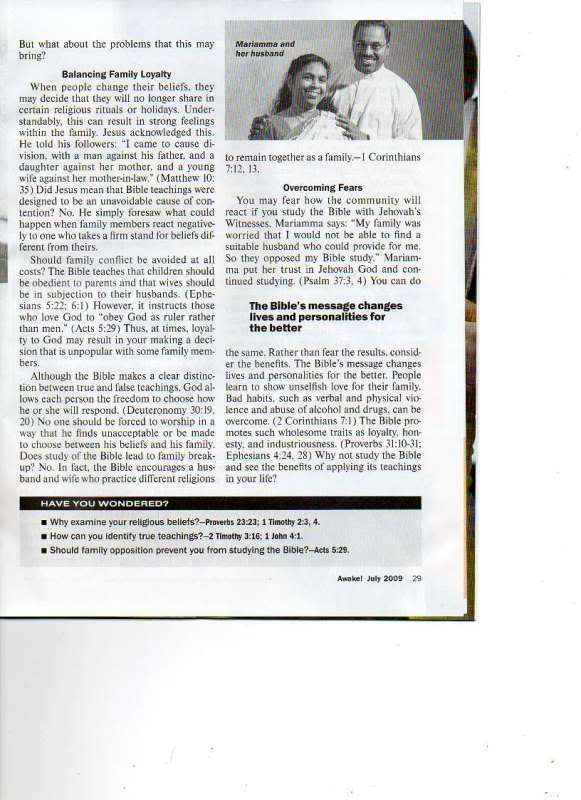 1994 May 22 p.2 admits that children of Jehovah's Witnesses have been losing their lives in support of this doctrine. The Watchtower stance is not only dangerous, but unscriptural and plagued with logical inconsistencies. The teaching that the Last Days started in 1914 is fundamental to the existence of the Watchtower Society, based on Jerusalem being destroyed in 607 B.C. However, all evidence proves Jerusalem to have fallen in 587 B.C., removing any basis for this Watchtower doctrine, and hence the reliant one that the Watchtower Governing Body was chosen in 1919. This is but one of many flaws of Watchtower interpretation regarding the Seven Times of Daniel 4. It is frustrating to have family and friends belong to a high control religion, and very difficult to change a person’s belief. No matter how obviously wrong the religion is, cognitive dissonance prevents a person giving up what they are comfortable with. It is critical to learn what is important to the person you are trying to reach, in order to understand how to help them. Whilst you will want loved ones to know why Watchtower is not the truth, do not rush into confronting them. You risk being labelled as apostate, which will destroy any relationship you have, and any chance of educated discussion. The following video from revealnews.org Feb 2015 by reporter Trey Bundy is the best summary I have seen of the history and doctrine of Jehovah's Witnesses, all in under 5 minutes.